As I stood during the worship music at one our campuses on Sunday, I watched one of my precious friends lead worship. As I stood there, I was moved by her heart. I know her. I know her story, her obedience, her struggles and I had the privilege of standing there and worshiping with her. Part of me wanted to rush the stage, to wrap her in my arms and tell her what she meant to me. I didn’t because that would have been disruptive and maybe just a little creepy. So, I stood there and I began to look around me at the people who I was worshiping with just at this campus. One right after another, I was struck with this same affection. These are the people I do life with. I share in their joys, their sorrows and partner with them to build the Kingdom of God. My mind continued to wonder to my brothers and sisters, just here at Willowbrook, that attend our other campuses. I have the opportunity to invest and be invested in. I found myself desperate to tell you–so many of you how I feel. My affection reminded me of Paul when he starts his letter to the Philippians. He speaks of a great affection for the church of Philippi. He had done life alongside these people. He has celebrated spiritual victories and worked through challenges. I feel like Paul. And I think, “What if they don’t know what they mean to me? 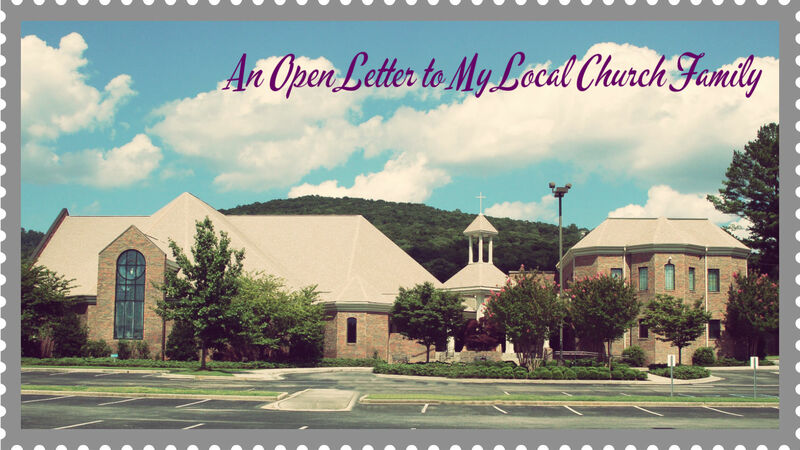 What if I don’t ever get to tell them?” So, here it is…an open letter to you, my local Church Family. It has been more than 7 years since Jared & I packed up our little home in East Texas and joined you in North Alabama. At the time, I was 7 months pregnant with our oldest and you showered us with gifts and love. Before I knew that I loved you, you loved me and my growing family. You didn’t know us. We hadn’t yet poured ourselves into you and still, you showed us love. You have watched not only our family grow from 2 to 4 but you have been part of encouraging Jared & I to grow as ministers and believers. You gave us the opportunity to love on your 5th-8th graders. You supported us as we played games with cheese puffs and shaving cream in an effort to disciple your children. You assisted us as we tried to pour ourselves into your family’s lives. When we were tired, you cheered us on. You never let us run the race alone. You are our teammates as we seek to build the Kingdom. You challenge and inspire us with your faithfulness and your radical obedience. We have learned to be better ministers, better spouses and better parents because of you. And now you allow us the privilege of ministering to you, as adults–the men and women of Willowbrook. I remember dreaming in my early years of ministry of one day leading women. God wasn’t opening those doors at the time, so I walked through the ones He opened for me. I didn’t realize that He was preparing and training me to lead the women of Willowbrook on this adventure of faith. In fact, I couldn’t have dreamed the women I might one day be privileged to lead would be women that spur me on with such fervor. You have been and continue to be vulnerable. You have entrusted us with your pasts and your moments of devastation. You have allowed us to celebrate new life alongside you, new relationships and new adventures. You have sought God with such zeal, I find myself humbled. Do you know what you mean to me? Do you know how unique you are? You are a church that gets “it”! You are on mission to reach the world. You believe if there really is more Jesus to be had, you want more Jesus. So many times, I feel a little guilty as a paid staff member because my “job” is to minister to you. Yet, you minister to me in so many ways. Church isn’t a hobby for you, it’s a training facility, a place to refuel for the race. I’m so crazy about you, I’m about to burst. Am I suggesting you are perfect? No, this letter isn’t written out of ignorance because I don’t know you. I know your flaws just as you know mine. But we are the Body of Christ. We, together, are the Show-and-Tell for the world to see Jesus. Thank you for being the local body that I’m both proud and humbled to be a part. This may sound like a letter that has a “BUT” at the end. There is no BUT…I just want you to know that it has not escaped my attention that I’m part of a church like this. Continue to press on. Continue to run the good race and know God is glorified as the Body works together–not because we have it all together but because of the finished work of Jesus, we have it all. Just started reading your Blog…Love It!! Your church family should know how blessed they are to have you there. Having known you in grade school with our son and seeing how your parents were raising you, makes me feel so good. There are some true believers and servers of Christ. I love reading your blog and posts on FB. I know your parents are overwhelmed with thankfulness at your service to the Lord. I wish I went to your church, but I go where we live and pray that I can have the servant’s heart you have. One day we will meet in Heaven and share our joys! I will share this with Chayne and his family as I am headed to see them in Germany next week. I will be there for Chayne’s graduation in July. He will have his PhD. His thesis was about the Hittites. Finally after 30+ years of school, he will graduate for the last time and have a job!!!! Remember Kindergarten? That was a long time ago in Kilgore, Texas. Bobi Ann continue serving the Lord and your family and He will truly bless you as He already has. Thanks so much Fran! What an encouragement. Absolutely beautiful!! I know that we too feel so honored to be a part of such a vibrant, loving church. It’s a pretty special place. Love my church! Despite its size, I always feel at home. You are a very talented teacher – I loved your teachings this spring! Thank you for your service.